One of my beautiful readers suggested that I tackle the issue of Matthew Christopher Nelson (better known as the idiot picture stealing jerk). Apparently she’d like to read my take on it, and I never like to disappoint you lovely people who spend time reading my ramblings. Unless you lived under a rock for the past week or so (not being on Tumblr almost counts as living under a rock these days!) you very likely heard about the guy who set up a Kickstarter fundraiser to make some money by way of stealing from one group of people and tricking another group of people into paying him for stealing. Here’s a link to a post on DoA about it, and here’s just one of the many posts on Tumblr about him. As soon as one person discovered his Kickstarter project, it spread like wildfire through our tight-knit community. He stole an enormous amount of pictures, and only a handful was actually shown on his Kickstarter project. When checking his Facebook profile there were even more stolen pictures. It appears he’s taken them down now, but if you go and check his pictures, you can still enjoy his flair for using filters on everything. You might want to wear some form of protective glasses. When you grow up, you’re supposed to realise that stealing is wrong. While most people understand that they shouldn’t fill their pockets with toothpaste in the supermarket, it appears that a lot think that art is free-for-all. And photography is hardly even art – you just snap a picture with your mobile, slap an Instagram filter on it and post it online. It’s hardly any work, so how can it belong to anyone! Reality is that while maybe even the majority of pictures on the vast internet are these took-no-work pictures of your friends hanging out or your dog being cute, other pictures are works of art in their own right that took incredibly long to produce. While it may take a second to press the shutter button, weeks may have gone into preparing a background, creating props and styling your doll. If that doesn’t make it art, I don’t know what will. And even if you don’t consider it art – well, guess what: It still isn’t yours to take! But in cases like this we see something worse than simply reposting that gorgeous shot of the doll you so admire onto Facebook and not telling people that it isn’t yours. In cases like this, it transcends from violating, insulting and selfish into actual stealing of not just intellectual and artistic property, recognition, and hard work, but also of money. When you try to sell someone else’s hard work, you’re not just taking the praise and admiration that rightfully belongs to them – you’re robbing them of money that could have bought necessities or materials for a new, amazing shot. When poor, unfortunate Nelson got his project shut down, he actually got angry – people shouldn’t mess with him. He took that down from Facebook later as well. I agree with him though. We shouldn’t mess with thieves, we should fine them and possibly put them in jail. But really. If he feels robbed of his hard work (let’s pretend for a moment that slapping filters on is hard, because he really must have used an awful lot of filters for those horrible results), then why can’t he understand that he is in the wrong? Or is he really that attached to the images as representation of his own characters that he genuinely feels entitled to them? He did the hard work of coming up with the story (supposedly), finding the right images, and photoshopping them, so now he has a right to them? I wonder what went through Nelson’s head when he chose the pictures to steal. Did he think he was targeting a small, insecure community? That people wouldn’t speak up because it’s embarrassing for an adult to own dolls? The community proved him wrong, and I’m sincerely hoping that other dishonest people take what happened this time as a warning. The community will forget all the anger and diversion within it and fight back when people steal our hard work. We interrupt our regularly scheduled programming for a rant: I wish that Lati would get their act together and ship my dolls! I can deal with waiting for my dolls. My LittleFee Leah (Kiri) in tan should ship the 16th of September. 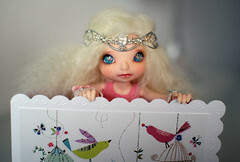 My LittleFee Ante elf faceplate (Rain) should ship around the same time. I can deal with that. What I can’t deal with is Lati’s insane shipping times. I know I get compensated in points (15% at this time), but when they’ve reached the points cap (the aforementioned 15%), they’re no longer in a hurry to ship out our dolls. At this point they might very well start spending a good deal of their work force on the next limited edition dolls. They’ve already started working on the basic dolls. And it’s not just that it’s taking forever. It’s the fact that I’ll likely be on my honeymoon when they arrive, and then it’ll get stuck in customs for more than a week, which means it’ll return to Lati. And I can’t ask Lati to get the act together and ship my dolls, because that will very likely result in the world’s crappiest face-up.